Each semester the Atmospheric Sciences Graduate Council (ASGC) invites graduate students in the Department of Atmospheric Sciences to participate in the graduate student seminar, semester-long friendly competition. The graduate students each volunteer to give a presentation of their research in meetings several times during the semester to hear each participant’s 15 minute talk. Each presenter gets valuable feedback from the group and anonymous constructive critiques, helping the graduate students improve their research presentation style and question-and-answer abilities. 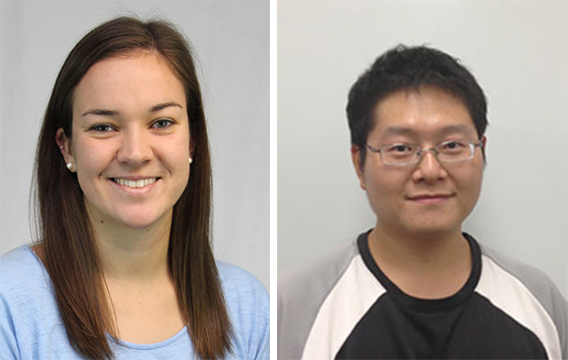 Brooke Adams and Chia-Pang Kuo won the Fall 2017 and Spring 2018 competitions respectively. “This competition is an extremely helpful tool for students to practice their thesis defense in a relaxed environment and receive feedback from other students, some of whom have already defended their own research,” said Sophie Mayne, president of the ASGC. The two presenters with the highest feedback scores from their peers win a monetary prize as well as the opportunity to present a seminar to the entire department. “This is an invaluable opportunity to speak in front of experts in the field with a variety of different interests,” Adams said, and it motivated her to think about her research in a broader scope.